Gardener wife's Asian persimmons are getting ripe and are wonderful. She has three kinds and all are the normal orange in color. One is like persimmon flavored sugar, one is crisp like an apple but with persimmon taste, and one looks like chocolate inside and is crisp, but has the normal persimmon taste. An Asian lady stopped by to visit and talk about the persimmons and said there is one that is flat in form and is crisp. Needless to say, I expect UPS to deliver that plant most any day now. Location: here and then there...! 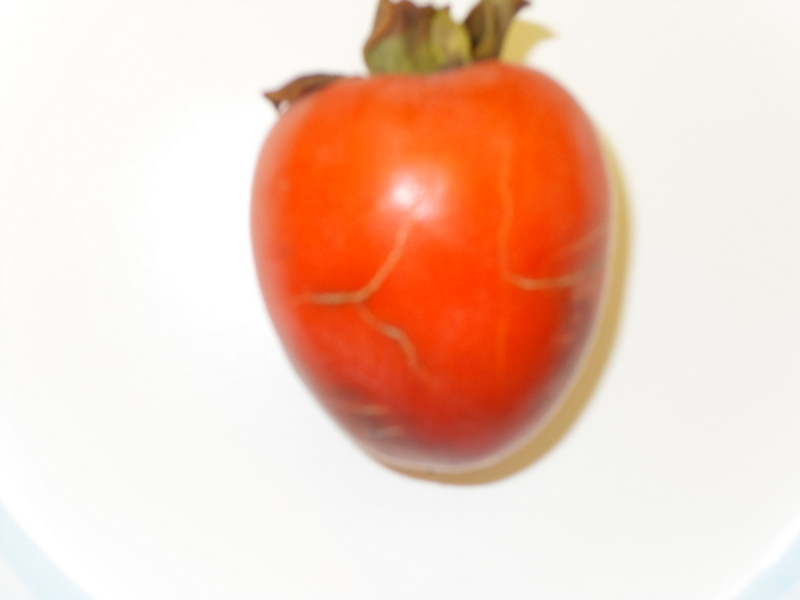 after years of thinking I did not like persimmons, tried one in school as a kid, a friend of mine offered me to taste- she was Vietnamese, so maybe i tried the real dry kind, would that be the Asian kind? today at a farmers market, wow, got a few of the round, ... flatter ones that are lighter in color and yummy!!! fun to (re) discover foods! I like the persimmons that tastes of cinnamon. I'm not a fan of the large pointy variety that's eaten gushy & pulpy. I brought one home from the nursery last August and even change its location in February. I was happy to see it sprung new leafs in the spring and thought to myself "Good, in a couple of years I will have tasty persimmons". Imagine my pleasant surprise when it flowered and I ended up with 9 persimmons at the end of season! What I like about Asian persimmons is that you can eat them when they're still crunchy, or wait till they're ripe & soft. They taste sweet in either case. Persimmons are the sugar plums of The night Before Christmas. I have two trees started form suckers taken from a native simmon tree. It took years but finally they began to produce fruit which ripen in November while the parent plant wasn't good until January. There is an older oriental with native cuttings growing in the middle of town that produces good crops almost every year in mid December. I use the Euell Gibbons book for some basic Rxs. The purple color of the 'bread' is as attractive as the taste. Many years I add wild shagbark hickory nuts that contribute a maple walnut flavor. Lot of work. Hey brother possum, throw some simmons down"
I have a 'Fuyu' oriental persimmon and some native ones ( I leave the natives for the critters). The Fuyu is kinda crisp like an apple, just depends on how ripe you let it get, it's non astringent though. 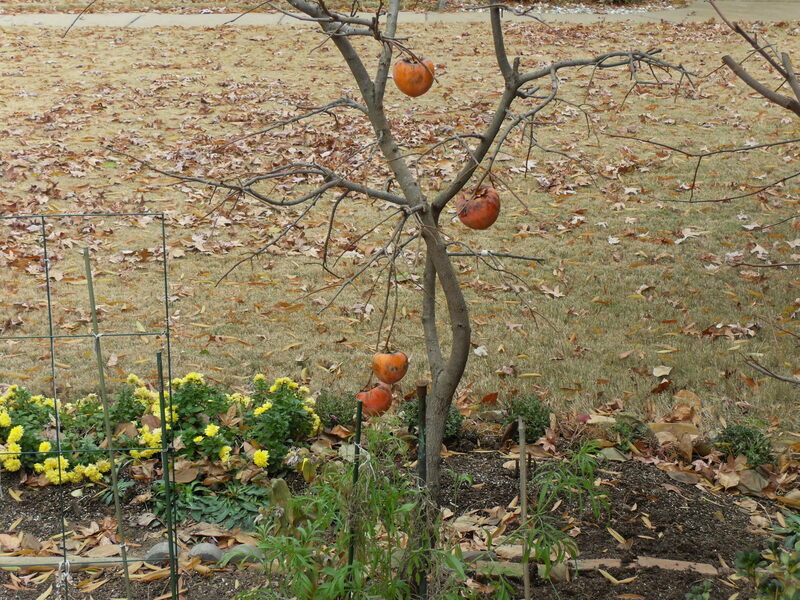 A lady up the street has a Tamopan persimmon tree that has funny shaped fruit. Her tree is loaded every year although i have never tasted them. Here are pix of wife's chocolate persimmon. They are about all gone. When she gives them to friends or neighbors she alerts them about the dark inside so they will not think they are spoiled. They are gooooood! 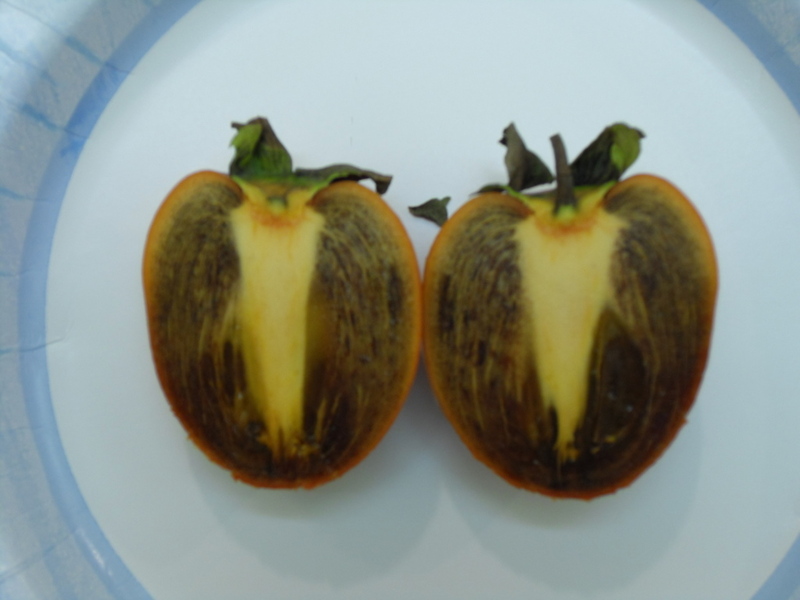 Here are the last of our Asian Persimmons. These are a little larger than a regulation soft-ball, and were gooood!